Whether it’s getting ready every day or relaxing in your tub, you spend a lot of time in your bathroom. So, why not take some time to make it your own? Even with a tighter budget, you can make changes that will increase your bathroom’s comfort and style — and maybe even the value of your home. You just have to know where to look for savings. With this in mind, here are some of the best ways you can save on your next bathroom makeover. Any home improvement project should start with a well-planned budget. A budget is your best bet to prevent overspending and find areas where you can save on costs. 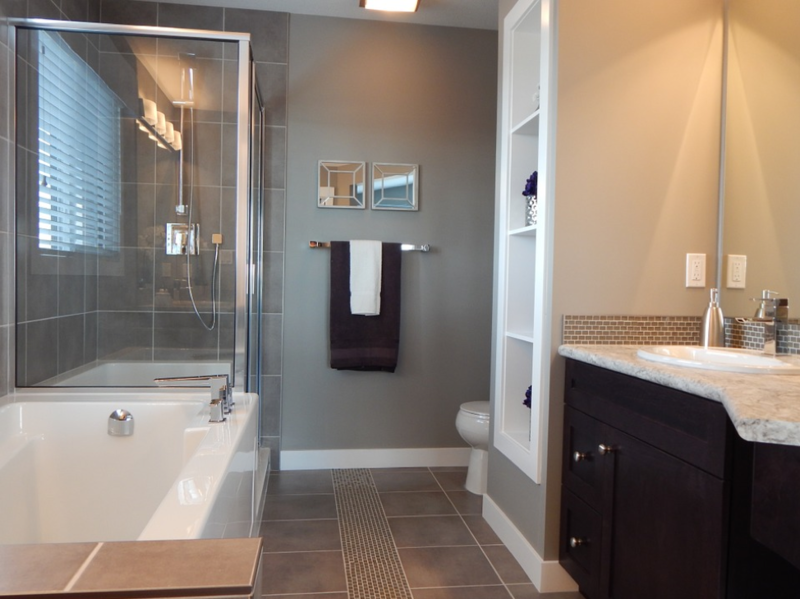 You can begin by listing what your bathroom needs first and then add some details you would ideally like to add. Next, gather quotes for all aspects of your remodel and shop around for savings on supplies. Materials can comprise much of your budget, so it helps to start there when looking for savings. Your best bet is to look around at local home improvement stores for savings and deals for retailers such as Lowe’s. Many home improvement stores offer special discounts to retired and active duty military members. If you are a veteran or a member of the armed forces, these extra discounts can help you save even more when it comes to your projects needs. Even without special discounts, there are still ways to save on your renovations. When it comes to repairs and upgrades around your home, being able to tackle projects on your own can be a great way to save some cash. There are tons of tutorials and tips to help you take on your DIY home improvement projects, as long as you are willing to put a little of your own time and effort into them. When it’s time to pick up some tools for the job, remember to check for sales at stores such as Home Depot to help you save a little money. You can also sign up for cost-cutting websites such as RetailMeNot to take those savings even further. For specialty equipment like tiles saws and sanders, try renting instead of buying to help keep your project under budget. These are tools you are likely to only use one time, so renting them makes more financial sense. While doing the work yourself can definitely help you save, there are definitely times you need to spend money on hiring a pro. You should always consult a pro when your bathroom remodel includes any major plumbing work or if you are planning on a major overhaul of your room. Doing so will save you a lot of time, money, and risk. A bathroom remodel tops the list of home improvement projects that can add value to your home. The value added, however, can be impacted by quite a few projects factors. Your reasons for making upgrades should definitely be considered first. If you plan on staying in your home long-term, then any changes you make should be more about what makes you happy. The ROI will really be more emotional, but if you are selling your home soon, you may want to take emotions out of the equation. In this case, you really need to be smart about how much you invest in your project and make sure you make practical renovations more of a priority. You can achieve results that will wow while saving money by using your existing layout, opting for basic refreshes, or even buying recycled materials to makeover your room. If you have a dream of making over your bathroom, your budget doesn’t have to keep that dream from coming true. By being smart about your supplies and project-planning, you can save yourself a lot of time and money and still get the results you want. So, have fun saving and have fun making your dream bathroom a reality!